Potatoes can be grown in a small space and on a small scale in any kind of bag that holds at least two or three gallons of soil. Because it is inexpensive, simple, and interesting, growing potatoes in a bag is a method often used by teachers in school gardening classes. 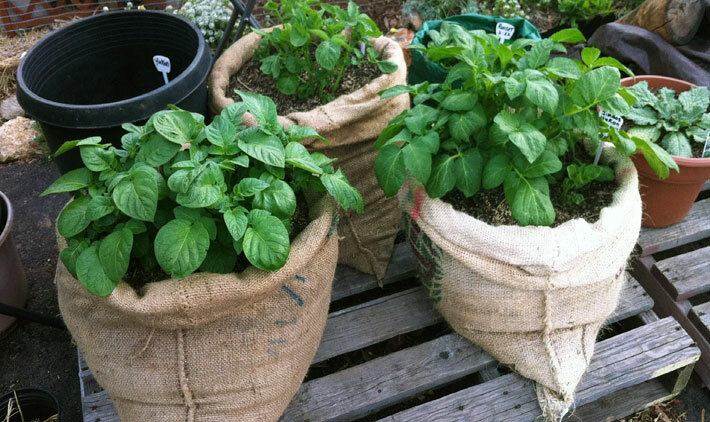 Its the perfect method for growing potatoes in small gardens, patios or even on balconies! Potato tubers form on short stems called stolons which sprout from the lower stems of new potato plants. The potato plants themselves are grown from small pieces of mature “seed potatoes” sold in garden centers or online, certified to be free of diseases; potatoes sold in grocery stores are usually not the best varieties for growing in home gardens, and are often treated to prevent sprouting in stores. Potatoes take up to four months to grow, and require cool weather – they cannot tolerate hard freezes, and stop growing and producing potatoes when temperatures start to stay in the 80s. This usually means planting in late spring, usually March through May depending on your climate. 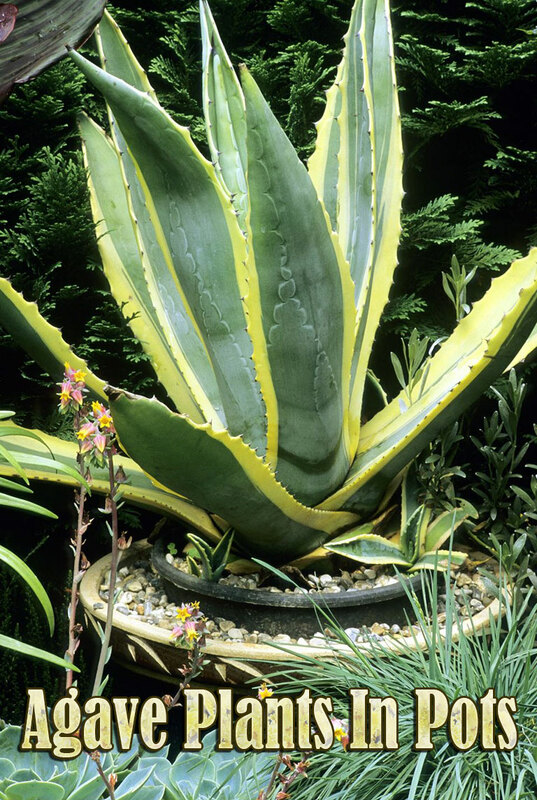 The plants require at least six or eight hours of direct sunshine daily, a little fertilizer, and regular watering, especially close to harvest. After about three months potatoes begin to fill out, usually about when the plants begin to flower. Most plants start to turn yellow when it is time to harvest, but some gardeners cut the plants down after about four months and allow the tubers in the ground to toughen up a bit before digging. It is very important, as plants begin to grow, to keep the lower stems covered with fresh soil or mulch to keep them in total darkness; stems exposed to sunlight may not produce tubers, or if they do the tubers may turn green and taste bitter – and even become a little poisonous to eat. Plant potatoes when the danger of frost has passed. Select the sunniest site possible. All-day sun is best, but as little as 6 to 8 hours will do. 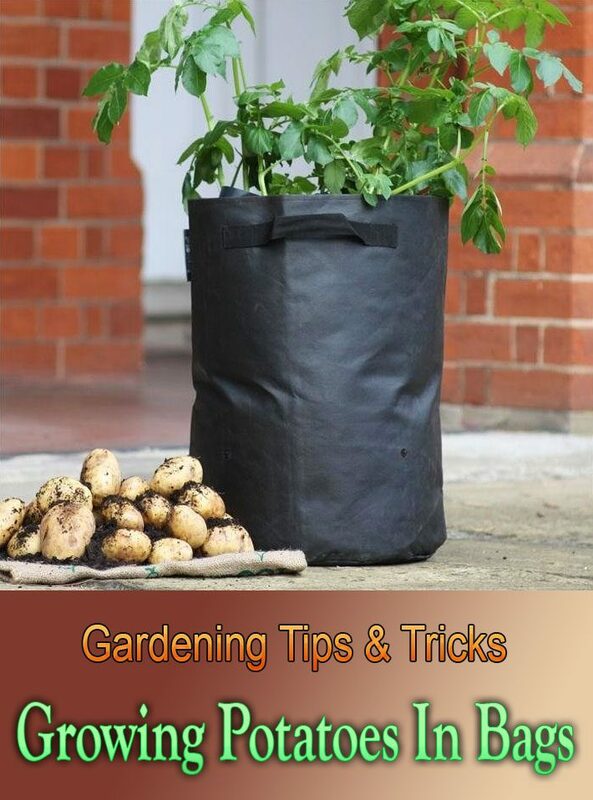 Keep in mind that you will need to water the Potato Bag regularly, especially if rainfall is insufficient. Put the soil in a wheelbarrow or tub that can hold it all at once. If you’ve chosen potting mix that does not have fertilizer in it, add granular fertilizer. Moisten the soil and mix thoroughly. About one-third of the soil will get used on planting day. The rest will be used as the plants grow. Set it aside. Small potatoes can be planted whole, but larger ones are usually cut into small pieces, each about the size of a large egg and with one or two “eyes” or stem buds. Some people let potato pieces sprout before planting, but this is not necessary. Punch small water drainage holes near the bottom of a grow-bag, medium size garbage bag, mesh burlap sack, or any other kind of bag (even a potting soil bag) that will hold at least two or three gallons of potting soil. Fill the bottom of the bag with a few inches of prepared mix of soil and fertilizer. Potato plants can grow fairly large, so don’t crowd them. Plant two, three, or four potato seed pieces in the soil, cover with a couple inches of soil, and water them well. Place the bag where it can get plenty of sunshine and remain cool – not a hot area like on a concrete patio or against a hot wall. Continue to water as needed to keep the deep plant roots moist, not wet. 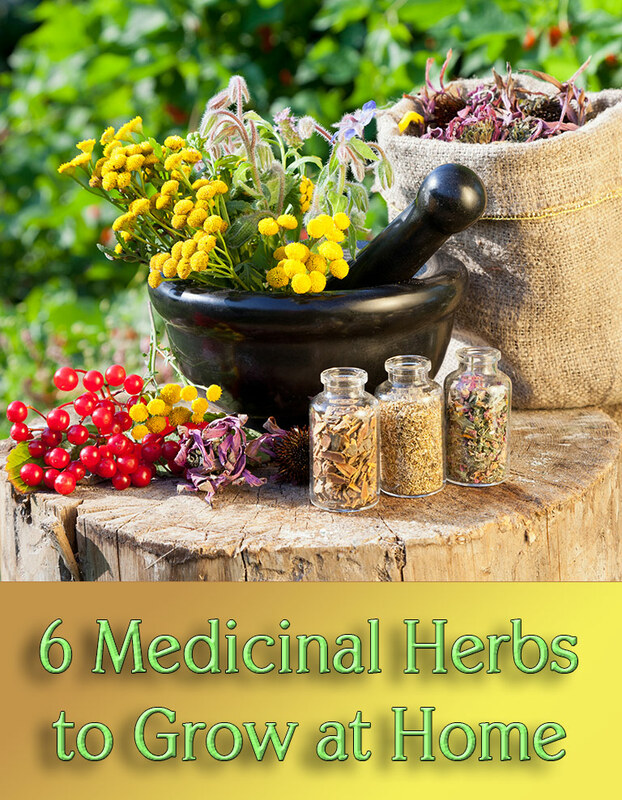 As the plants begin to grow, gently sift three or more inches of fresh potting soil or a thick mulch of hay or bark around the plants, enough to cover the lower stems and leaves. Continue this weekly until the bag is nearly filled with soil or mulch. Continue to water enough to wet the roots down deep without keeping the plants wet. Water regularly: The porous fabric allows the Potato Bag to breathe, which prevents overheating and overwatering. However, it’s important to monitor the moisture level in the bag because it can dry out quickly. The soil should feel moist, not soggy. In the hottest part of the summer, it might be necessary to water every day. Watch for pests: Colorado potato beetles are the most common pest. Inspect your plants regularly, looking under the leaves for the clusters of yellow eggs. If you see them, rub them off with your finger. Adult beetles are easy to identify — and control: Just pick them off with your hands and toss them into a bucket of soapy water. 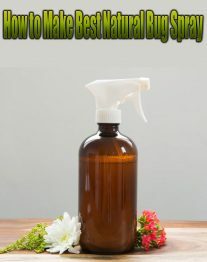 The beetles might bother your plants for a few weeks; just keep monitoring and hand-picking and your plants will be fine. After three or four months, the plants should start to turn yellow and even flower. Empty the bag — plants, soil and all — into a wheelbarrow. Dig through the soil and pull out the potatoes. You can expect to harvest about 7 lbs. of potatoes, although you could get as much as 13 lbs. in a good year. Add the old soil to your garden or compost pile. Clean out the bag and save it for next year. Cook the small potatoes quickly, or store larger ones in a cool, dry, shaded area indoors until ready to use.